South-West London, 1986: after a short apprenticeship playing pots and pans, I had been given a very cheap kit by my parents and was taking my first steps towards the world of ‘serious’ drumming (yeah, right… Ed). I was also fast becoming a major jazz/rock fan, buying the new Weather Report, Mike Stern, Billy Cobham, Lyle Mays, John Scofield and Steps Ahead cassettes from HMV on Oxford Street or my local Our Price in Richmond. One evening, my dad had my uncle round for one of their regular music-listening sessions. I gatecrashed. They cranked up the Plastic Ono Band, Santana, Monk and Miles while I sat in on a knackered Spanish guitar. 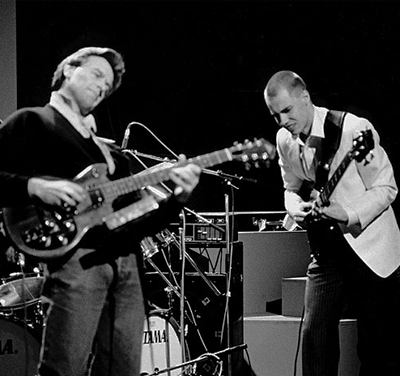 Already being a huge major Billy Cobham fan, I had heard bits of Mahavishnu, mainly the mid-80s incarnation featuring ex-Miles sax player Bill Evans and bassist Jonas Hellborg. I was also aware of John McLaughlin’s playing due to his guest spot on Stanley Clarke’s incredible Journey To Love album (though didn’t know it was him on ‘Song To John’ until years later). Anyway, I was in: I came across a Mahavishnu Best-Of on cassette at my local Our Price, and a whole new world of music opened up. It was time to go back and explore the roots. For another Mahavishnu moment, check out 1537, and let me know yours. I first heard guitarist John McLaughlin as a very impressionable 15-year-old when I stumbled across the unsettling, brilliant ‘Dance Of Maya‘. I was instantly fascinated, excited and intrigued by the Yorkshireman’s soundworld. Since then I’ve explored every aspect of John’s prodigious career, from his early days on the ’60s UK session scene, through his time with Miles, the Mahavishnu Orchestra and Shakti, right up to his current jazz/rock quartet. But Adventures In Radioland, the second album from the ’80s reincarnation of Mahavishnu, was released in probably the least-heralded era of John’s music, a time when jazz and fusion seemed to be going in diametrically opposite directions and decent record deals were hard to come by (although he was still a big live draw). 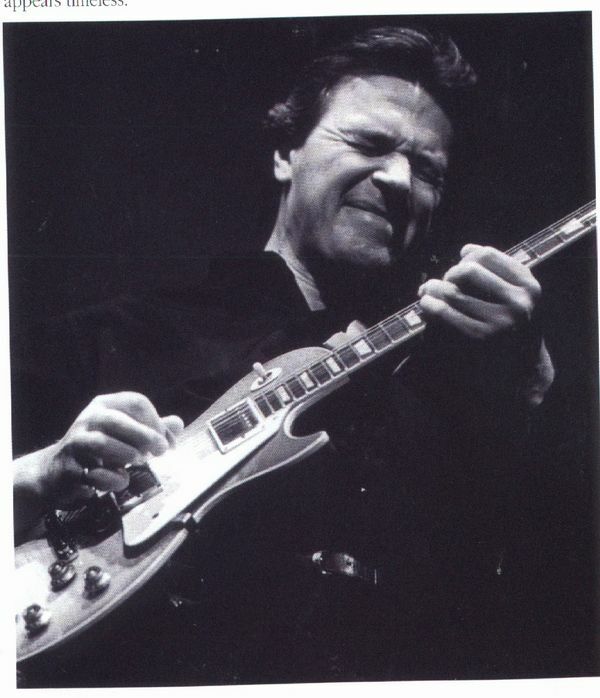 With hindsight, it seems the mid-’80s popularity of Pat Metheny was having a huge influence on many instrumentalists and John was no exception; the decade was full of guitarists utilising synthesizer technology and looking to Brazilian songforms for inspiration (an obvious example is Al Di Meola’s Soaring Through A Dream). But McLaughlin’s take on Metheny was far more raunchy, rooted in bebop and the blues. And what a shocking record Adventures In Radioland was coming from a mainstream jazz artist, a two-finger-salute to the Young Lions neo-bop boom represented by the Marsalis brothers et al. John seemed to be going out of his way to annoy the jazz purists but in doing so produced some material of worth. Like some of the best fusion music of the ’80s, its deceptively slick production obscures some pretty radical improvisations. Opener ‘The Wait’ luxuriates in pleasant synth washes and a gorgeous chord sequence for a while before McLaughlin grabs the Les Paul and unleashes one of his most intense solos over quite a funky little R’n’B bass vamp. ‘The Wall Will Fall’ fuses a gargantuan blues riff with nutty Simmonds drums fills, and McLaughlin’s furious solo over high-speed bebop changes is both funny and exhilarating. ‘Florianapolis’ initially steers dangerously towards Metheny territory with its breezy, major-chord cod-Latin groove and nasty DX7 synth sounds. But before you know it, McLaughlin has ripped into an absolutely outstanding acoustic solo, full of rhythmic/melodic risk-taking. ‘Jozy’ is a dramatic, swinging tribute to Joe Zawinul, beautifully marshalled by drummer Danny Gottlieb with some outstanding fretless bass work from Jonas Hellborg. ‘Gotta Dance‘ comes on like a fusion Mr Bungle, rattling through mellow acoustic guitar, big-band jazz, Mark King-style slap bass and industrial drums all in the space of four minutes. And ‘Half Man Half Cookie’ is even weirder, a kind of post-Scritti Politti pop/funk groove interrupted by yet another incongruous big-band interlude from a multi-tracked (or sampled?) Evans. But the mid-’80s Big Drum Sound is generally overbearing and sometimes detrimental to some fine music. McLaughlin regrouped after this album and played the nylon-string acoustic exclusively for a few years, and it’s not hard to see why – with a few notable exceptions. Adventures In Radioland is hard to find these days but worth seeking out.